It’s hard for any university to turn down a multi-million dollar donation from an alumnus, even if you have to name a stadium after a notorious private prison company to do it. After students of Florida Atlantic University occupied the office of president Mary Jo Saunders, she agreed to sponsor a public discussion on the propriety of naming the home of the FAU Owls after GEO Group, the second largest private prison company on the planet. 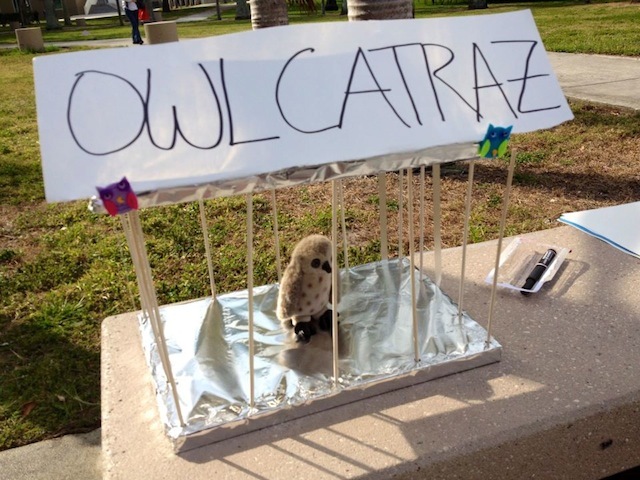 The clever student who thought up the “Owlcatraz” name should be given a large cut of the credit on this one–that name is going to stick! Meanwhile, GEO is fighting back. Criticism of the company’s record has centered on the dreadful conditions discovered at GEO’s Walnut Grove facility in Mississippi. Now GEO vice president for corporate relations, Pablo Paez is claiming that GEO didn’t even run the Walnut Grove facility until August 2010 and therefore can’t be blamed for problems they inherited from their predecessor. In August 2010, GEO took over operation of the Walnut Grove Youth Correctional Facility. A few months later, in October 2010, the U.S. Department of Justice notified the State of Mississippi that it had opened an investigation into conditions at Walnut Grove. In November 2010, the ACLU and the Southern Poverty Law Center jointly filed suit against GEO and others responsible for the facility, alleging that conditions in the facility violated the Eighth Amendment’s prohibition against cruel and unusual punishment. Beginning with site visits Jan. 10-13, 2011, and throughout 2011, the DOJ continued its investigation of Walnut Grove. During the same time period, the ACLU continued to litigate its case in federal court. On March 26, 2012, Judge Carlton W. Reeves, the Mississippi federal judge overseeing the litigation, presided over a hearing in which he heard evidence of the ongoing abuse and neglect at Walnut Grove. On April 20, 2012, Mississippi Commissioner of Corrections Christopher Epps announced that Mississippi was ending all of its contracts with GEO. Nothing has curtailed actions of the staff and indifference of management officials to the constant violations, even though the parties and their experts have been monitoring, investigating and conducting on-site visits constantly since before the lawsuit was filed and during the pendency of this action. Moreover, the fact that the DOJ dared to begin its investigation in October 2010 has not caused the defendants to transform the facility into one that complies with the United States Constitution. But even more astounding is the fact that the notice of the fairness hearing itself did not cause the defendants to change course. The testimony established that only two days before the hearing, the facility remained so understaffed that a teenage offender was brutally attacked by several other offenders while only one staffer was on site. As of the date of the [March 22, 2012] hearing, according to testimony, management has done nothing to address staffing issues. WGYCF [Walnut Grove Youth Correctional Facility] has allowed a cesspool of unconstitutional and inhuman acts and conditions to germinate, the sum of which places the offenders at substantial ongoing risk. In other words, GEO made no serious attempt to reform its low down, crooked ways at Walnut Grove even after two high profile civil rights organizations had filed a joint complaint and the DOJ was conducting an investigation. How’s that for a show of contempt? I’m going to say it everytime the subject comes up: incarceration for profit is immoral!